Global steel production declined slightly from March to April, totaling 148.3 million metric tons and slipping 0.07% for the month, with declines in most of the largest steelmaking nations. The exception was China, where raw-steel output increased 3.7% month-over-month. 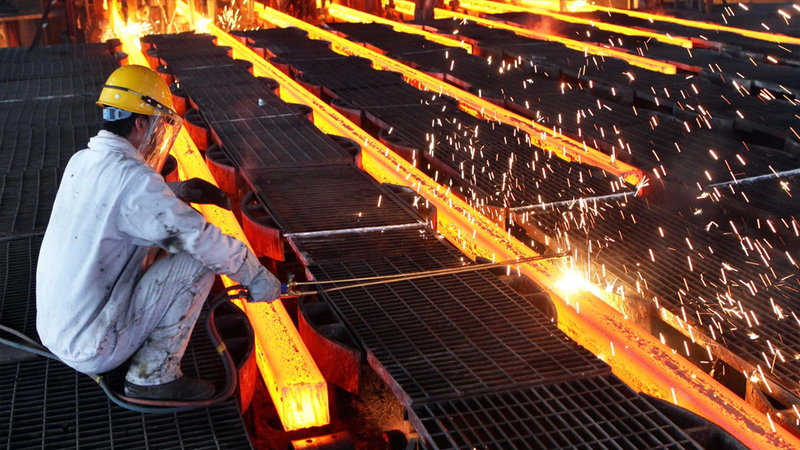 Despite ongoing efforts to curtail excess and outdated raw-steel capacity, China remains by far the world’s largest steel-producing nation. Beyond China, the April results show some indication of moderating expansion in global raw-steel production. The new monthly total is 4.1% higher than the April 2017 total output, and brings the year-to-date total for 2018 to 575 million metric tons, or 4.0% more than the January-April 2017 total. The results are supplied by the World Steel Assn., which tracks raw-steel output and capacity utilization by steelmakers in 64 nations, accounting for about 99% of total raw-steel production worldwide. Raw steel is the output of basic-oxygen and electric-arc furnaces, and cast into semi-finished products, like billets, blooms, and slabs. While the past year has seen a steady expansion of raw-steel production, recently World Steel Assn. forecast that demand for steel used in manufacturing and construction will continue to rise in 2018 and 2019, having regained stability in 2017 after two years of volatility and contraction. World Steel Assn. also reported that global raw-steel capacity utilization rose 2.4% from March to April, to 76.9%. This figure also is 2.4% higher than the April 2017 utilization rate. producers increased their raw steel output for April to 76.7 million metric tons, a 3.7% rise from March and an increase of 4.8% over April 2017. Through the first four months of 2018, the Chinese industry has produced 289 million metric tons, an increase of 5.8% versus last year’s January-April total. In Japan, April raw-steel production totaled 8.7 million metric tons, 4.0% less than in March and -0.4% less than during April 2017. Through April, the Japanese industry’s YTD total output is 35.1 million metric tons, or just 0.4% over last year’s comparable totals. Indian raw-steel production fell 5.8% from March to 8.7 million metric tons during April, though that figure is 5.6% higher than the April 2017 result. For the year-to-date, Indian producers’ output is up to 35.4 million metric tons, 4.2% higher than the comparable 2017 figure. In South Korea, raw-steel production fell 3.3% from March 5.9 million metric tons in April 2018, but that figure is 7.1% higher than the April 2017 total. During the January-April period, South Korean steelmakers produced 23.7 million metric tons, 3.8% more than the comparable figure for last year. Across the 28 nations of the European Union, April raw steel production totaled 14.9 million metric tons, which is 3.2% less than during March but 3.4% more than during April 2017. The YTD total is 58.2 million metric tons of raw steel, 2.0% more than last year’s four-month total. The German industry produced an estimated 3.8 million metric tons of raw steel, which is 3.2% less than the March result and 1.7% less than the April 2017 result. The January-April total for raw steel production in German is 14.8 million metric tons, nearly even (-0.2%) with the comparable total for 2017. Italian steelmakers produced 2.1 million metric tons of raw steel during April 9.9% less than during March but 3.7% more than during April 2017. The four-month total for 2018 is 8.5 million metric tons, 3.9% higher than the corresponding result for last year. In France, steelmakers produced 1.4 million metric tons of raw steel during April, up 3.4% from March and up 10.7% compared to April 2017. The year-to-date raw-steel output in France is up 4.0% over last year to 5.4 million metric tons. In Spain, April raw steel production remained nearly even with March (+0.46%) at 1.3 million metric tons, up by 7.5% over April 2017. The four-month total for Spanish raw-steel production is 4.9 million metric tons, nearly unchanged (+0.6%) with last year’s figure. Turkish steelmakers produced 3.0 million tons of raw steel production during April, down by 12.3% versus March and down by 3.1% on April 2017. The total production in Turkey for the current year is 12.5 million metric tons, up by 5.1% over last year. In Russia, April raw steel production declined to 6.0 million metric tons, down 3.2% from March but 2.4% than the total for April 2017. For the current year to-date, Russian steelmaker have produced 23.8 million metric tons, which is slightly higher (0.94%) than 2017’s four-month result. Steelmakers in Ukraine produced 1.7 million metric tons during April, 0.6% more than during March and 6.0% more than during April 2017. Their total for the first four months of this year is 6.98 million metric tons, which is only 0.2% less than last year’s January-April total. The Brazilian steel industry produced 3.0 million metric tons during April, 3.8% less than during March but 1.8% more than during April 2017. Their four-month output for 2018 is 11.6 million metric tons, a 4.0% increase over the same period of last year. Finally, the U.S. steelmakers produced 6.93 million metric tons (7.64 million short tons) of raw steel during April, 5.5% less than during March but 3.6% more than during April 2017. Their January-April raw-steel output was 27.74 million metric tons (30.58 million short tons), 2.8% higher than the four-month result for 2017.